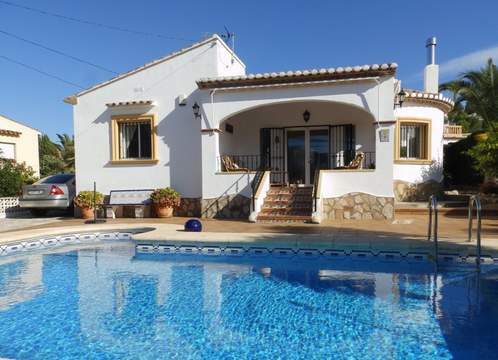 Villa for sale with Orba valley and sea views in Orba. The villa consists of two floors. The ground floor is distributed into a living-dining room, a kitchen, a bathroom and a bedroom. The first floor is distributed into a living-dining room, an open kitchen, a glazed naya, a bathroom and two bedrooms with fitted wardrobes. Also there are extras such as electric central heating, gas or wood fireplace, double glazing, garage, 6 x 3 m swimming pool and an outdoor shower. Orba is a typical Spanish village with its bars and restaurants. All services are nearby, as for example the supermarket is just 3 minutes by car. In Ondara is the largest shopping center in the area, which is 15 minutes away, as well as the motorway to Valencia (1 h) and Alicante (1 h).